Russian legendary folk extreme metallers Изморозь (Izmoroz) have announced the release of their 7th full-length album in cooperation with Triple Kick Records. 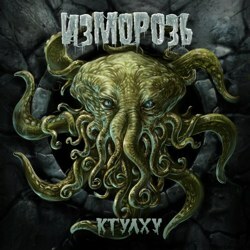 The long awaited new album, is entitled “Ктулху” (Cthulhu) and will be released on 21st of December 2013. Hurricane riffs, funny and catchy lyrics and highest quality recording; all this and much more can be found on the new release of this cult band! The album was recorded at KIV Records and the band has revealed the brilliant cover artwork by Alexander Tartsus. A special release party with autograph session will be held in the rock shop “Культура” in Moscow on December 21st. In order to promote the album, Изморозь will tour with Butterfly Temple. You can find more details about the release party and gigs in the band’s official pages below.